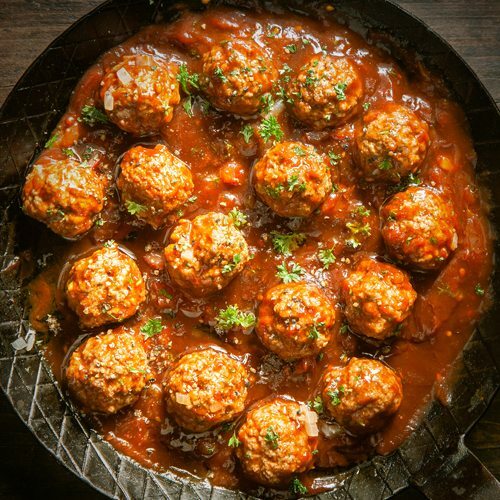 The chia seeds act as the egg in this recipe – holding the meatballs together. In a small bowl combine the chia seeds and the bone broth – allow to rest for 20 minutes. In a large bowl combine chia and broth mix with the remaining ingredients. Once evenly combined, roll the mixture in small balls. Cover & refrigerate for 1 hours. In the meantime, prepare the Napoli sauce. Saute the onion, garlic and rosemary over medium heat. Once the onions have softened add the lemon juice, bone broth, tomatoes, passata, salt & pepper. Allow to simmer over medium heat until the liquid thickens. At this stage the meatballs can be removed from the fridge and barbecued or grilled until golden. With the sauce thickened, add the meatballs and stir. Serve meatballs with pasta of choice or zucchini pasta (zucchini grated to look like pasta).